Steven Spielberg and Peter Jackson's The Adventures of Tintin: The Secret of the Unicorn opens with a marvelous animated credits sequence that both honors the beloved (worldwide, not so much in America) comic strips by Herge while outdoing the memorable opening credits to Spielberg's own Catch Me If You Can. 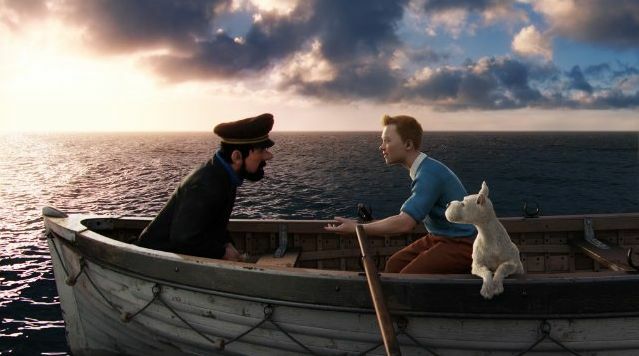 Jackson's WETA animation beautifully and smoothly brings the characters of Tintin (voice of Jamie Bell), Captain Haddock (voice of Andy Serkis), bumbling bobbies Thomson and Thompson (voiced by Nick Frost and Simon Pegg), and Tintin's lovable dog Snowy to CGI life, with fully believable emotions and facial expressions. 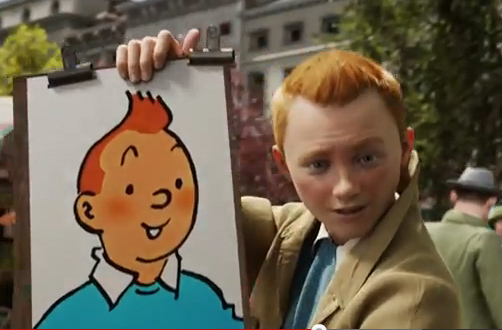 Tintin's adventure-packed world of 1950s Belgium and points beyond are also splendidly and lushly rendered. In The Secret of the Unicorn boy reporter Tintin uncovers a mystery involving a model pirate ship that sends him across the sea and into the deserts of Morocco chasing after fabled pirate treasure. Along the way, Tintin meets drunken sea man Captain Haddock and runs afoul of the villainous Sakharine (voiced by Daniel Craig in a terrific performance where you'd never know James Bond is the villain of the story). Invoking the spirit of his Indiana Jones-anything goes adventures, Spielberg's Tintin is a wild, non-stop, roller coaster of blistering action set pieces and death-defying thrills. Despite combining three of Herge's Tintin comics to round out the story, Tintin's action is absolutely relentless and all but overloads on its manic pace by the third act. Tintin himself turns out to be a very serious boy reporter indeed, though he is understandably angry that modern day descendants of pirates keep trying to murder him. Haddock is a lovable foil for Tintin, though more apologetic about his alcoholism than he ever is in the comic strips. Snowy steals every scene he's in, as he's wont to do. Though Tintin himself would probably have appreciated his first Hollywood film slowing down the constant life-threatening predicaments he's placed in and playing up the whimsy of the comic strips, overall the combination of Steven Spielberg's direction and Peter Jackson's WETA animation do Tintin justice.